DavidsTea’s Dragonwell smells like roasted seaweed. If you’re not sure what roasted seaweed smells like, you really ought to get yourself to your nearest Asian grocer and track some down (it makes for a fantastic snack). I was actually a little surprised at how salty it smells because I’ve had other Dragonwell teas before (before the inception of One More Steep) and I don’t remember them being as salty smelling (although I could be wrong). The leaves are long and flat, having been pressed while heated. They’re a very pretty green colour, and it’s overall a very nice to look at tea. Not as fun as, say, blooming teas, but still lovely to look at nonetheless. 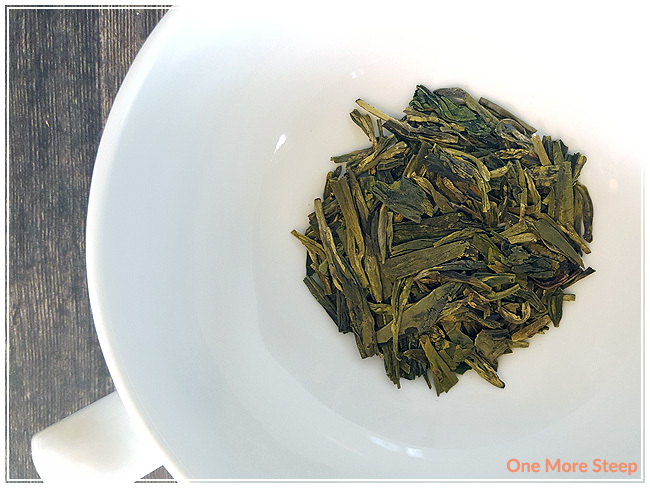 Dragonwell consists of: green tea from the West Lake Region, Hangzhou area, Zhejiang province, China. Wikipedia has a page dedicated to Longjing tea (Dragonwell tea). The tea leaves are fairly uniform, most of them are about an inch in length, to give you an idea of the size when the tea is dry. DavidsTea recommends steeping Dragonwell in 85°C (185°F) water for 3-4 minutes (since I bought the tea initially in February of this year, DavidsTea updated their steeping temperatures to 75-80°C/167-176°F). I tend to steep my green tea for less, I opted for 3 minutes for the first steep. Dragonwell steeps to a very nice light yellow. The tea itself smells like roasted seaweed (still! ), and it isn’t off-putting – but I also like roasted seaweed so there is that. Dragonwell has a saltiness to it that is quite appealing to my palate. There’s a bit of vegetal taste to it that isn’t quite like seaweed, but I do get a seaweed-esque taste from the tea itself. Overall, it’s a very nice cup of tea that isn’t bitter at all. 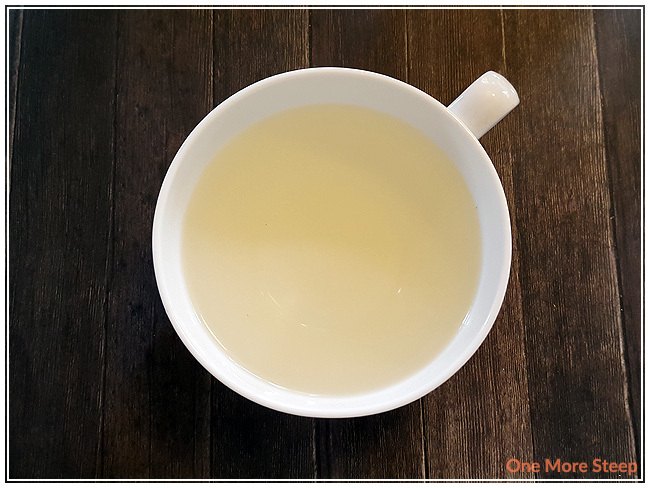 I would definitely caution you not to oversteep or burn the leaves – a bitter cup of green tea is gross and should not be sipped. Dragonwell does very well with being resteeped! 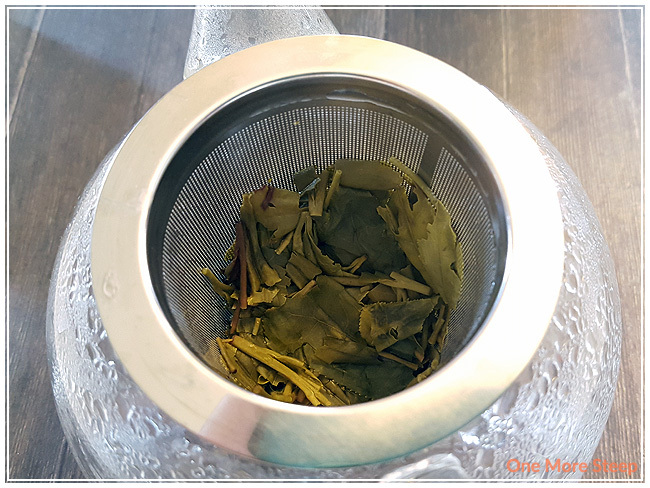 I did my usual resteeping method (adding an extra 30 seconds for every subsequent resteep) and I resteeped these leaves an additional three times. Each time the tea had that salty vegetal goodness and remained pleasant and enjoyable. The colour of the tea itself didn’t get too much darker. 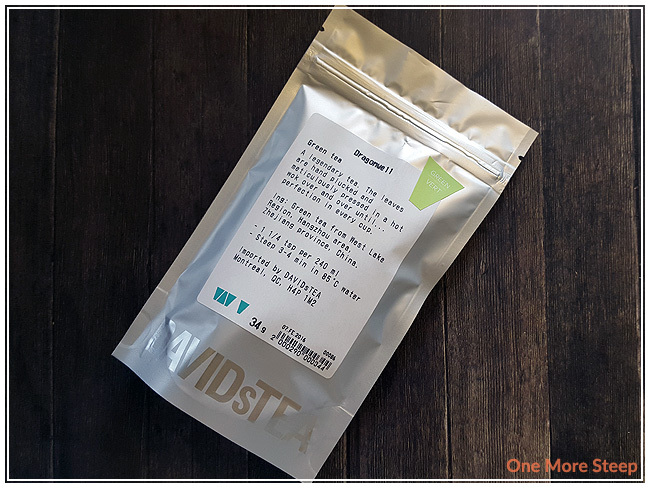 I loved DavidsTea’s Dragonwell. I found it to be a very enjoyable cup of tea. Some people might find the saltiness a bit off-putting, but I think it’s worth a try. It isn’t terribly expensive, as far as Dragonwell teas can be, and it isn’t a terribly low quality version of Dragonwell either. I think it’s well worth the price, considering its ability to hold up to resteeping and the overall tastiness.